The rooms of Oasi Favignana Village Hotel. Sleep away from the chaos of the center and surrounded by nature. Rooms furnished following the theories of Color Therapy and Aroma Therapy. Available in the colors of the four elements of the Nature. 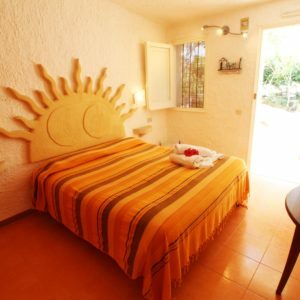 Double and twin rooms, recently renovated with simple Mediterranean style furnishings, are available in 4 colours: Violet, Orange, Sun Yellow, Mediterranean Blue. All equipped with all the main comforts: TV, air conditioning, hair dryer, private bathroom, linen / towels and all the necessary for your personal needs. Room surface range about 14/17 m² Free Wi-Fi connection. They are the ideal choice for couples with a small child. Here you can add a free baby cot / crib. This option is available only on request and only in some rooms. 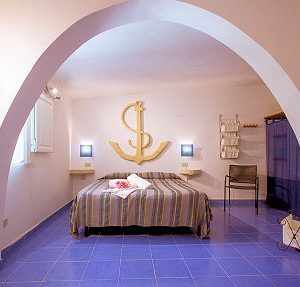 These 9 sqm rooms are an intimate refuge in the heart of the Oasi Village Hotel Favignana . The wide open spaces, in the common garden, offer the opportunity to relax in the areas equipped with deck chairs, hammocks and chaise lounges. All equipped with the main comforts: TV, air conditioning, hair-dryer, private bathroom, bath / room linen and necessary for your daily needs. Free Wi-Fi connection.